The Philippines are basically a cheap country. The cost of living and any labor or service is much cheaper than in any other country in Europe or the US. But is that also true for an island like Boracay? How much do you have to spend every day to cover your daily needs and how much for the activities you can do on Boracay? 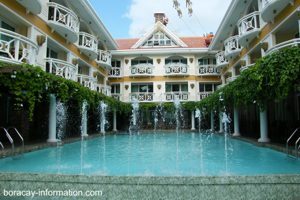 This page will give you an rough overview about the prices on Boracay so that you don't get ripped off by taxi drivers and commission hunters. There is an extra page here about the transfer costs from Kalibo or Caticlan Airport to Boracay: Boracay Transfer cost. 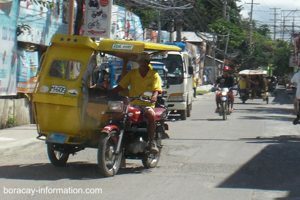 The main public transport vehicle on Boracay is the Tricycle. The drive up and down the main road from like 5 am till late at night, so no worries about catching the first plane in the morning. A "Special Trip" from the pier to any hotel along White Beach is 100 Peso per Tricycle. If you use the Tricycle as a public taxi with more people on board, it's only 25P but per person. If you jump on and off at any place along the main road between station 1 and 3, you pay 20 Peso per pax, fixed price. Public transport is only along the main road. As soon as you ask the driver to bring you in any side road, to a hotel or another beach, it's considered a special trip and you have to pay at least 100 Peso. Another "Special Trip" from White Beach to the northern end of the main road at Puka Beach, is 150 per Tricycle, one way. Sightseeing around the island they will ask 300 P per hour but you can bargain it to 250. You need at least 2 hours to see all the interesting beaches, without any longer stop over. Hotels and Resorts along the beach front on White Beach, have walk in prices from 2000 - 2500 Peso upwards during the high season. Any accommodation that is not directly at the beach front but with a 3 or 5 minutes walk to the beach, start at about 1500 Peso per room/night. You can expect another price increase during the Super Peak Season from Dec, 15th till Jan, 10th, every year. But you can also expect great discounts during the Low Season from May till October. High Season is from November till April. Hotel rooms cheaper than 1500 Peso you can still find at the outskirts of White Beach and at other beaches on the island. Motorbikes for rent are a rare business on Boracay and if you find one, they will ask moon prices for their bikes. Half day is about 800 Peso and 1500 for a full day, morning till evening. For sightseeing, it's cheaper to use a Tricycle. 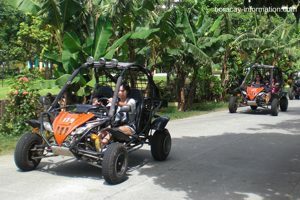 Also the buggys you can see on the picture here are at least 1000 Peso per hour. The most popular variant of dinner on Boracay are the many BBQ's along the beach. "Eat all you can" starts at 250 Peso up to 350. Drinks are extra. A original italian pizza is worth at least 450 Peso, a little cheaper are the pizza chains like Yellow Cab or Pizza Hut. American Breakfast at the hotels start at 150 Peso, same for a Filipino Breakfast. Cocktails in any of the bars along the beach go for 150 Peso upwards and a simple beer (St Miguel, bottle) starts at 50 Peso. Soft drinks are available for 40 Peso in most restaurants. Watch out for the Happy Hour and get 2 drinks for the price of one!